What Should I Do if My Adult Siblings Won't Talk to Me? Settle peer conflicts to sustain long-term healthy working relationships. Life is full of struggles with peers at work. Everybody has flaws, but when seriously flawed people are part of your work environment, conflict can arise. 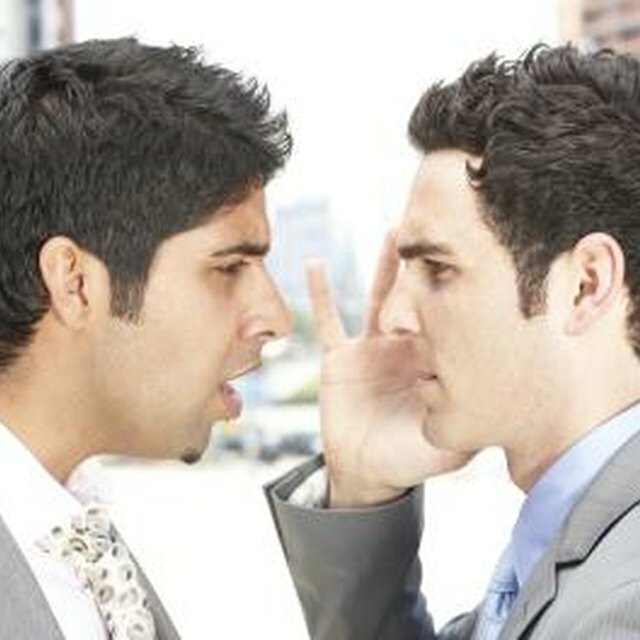 Settle disagreements before they escalate to a serious workplace problem. There are ways to come to an understanding that can resolve any grief. Often, opening up and considering other people is all that is needed. Ask your peers what is bothering them. In any conflict, people have at least one issue and this problem is often not communicated. Asking for clarity will at least shed some light on the situation so you can deal with it. Try to find an agreement. If you are struggling with working relationships, try to establish that all parties involved still want to be happy working together. Say something like, "Despite our differences on this matter, I would like to work smoothly and effectively with you." All parties will need to agree on improving the relationships. Discuss the problem in a calm manner and use inclusive words, such as "we." You will resolve more peer conflicts if you say something like "We should work this out," instead of, "You guys and I better settle this." Avoid emphasizing your peers' character traits that annoy you. Focus on what they are saying instead of how they smell, sound or look. They often can't help their annoying characteristics, but they do have control over their words. Explain how each person could benefit if there was no conflict. If there is something you need from the peers, suggest that you will be able to help them in the future. Try not to be stubborn. If you are able to reach a compromise, you might be able to come to a better agreement. For example, tell your co-workers they can have time to share their opinions but they must wait for you to finish speaking and you will do the same for them. Take your problem to a third party for resolution. For example, if at your business meetings your peers continue to interrupt each other and no logical pattern of discussion flows, you could bring your boss into the next meeting as a mediator. She may be able identify the fallacies and improve peer relations for the future. Phillip Chappell has been a professional writer in Canada since 2008. He began his work as a freelancer for "Senior Living Magazine" before being hired at the "Merritt News" in British Columbia, where he wrote mostly about civic affairs. He is a temporary reporter for the "Rocky Mountain Outlook." Chappell holds a Bachelor of Journalism in computer programming from University College of the Cariboo.